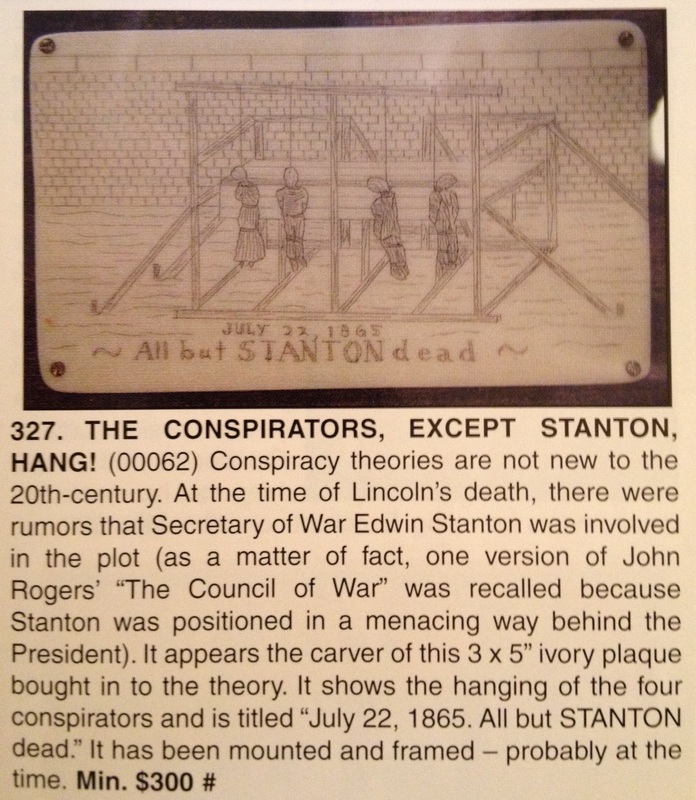 It is interesting to think of the individual who painstakingly engraved the death of the conspirators on a plaque of ivory only to turn it into a platform for condemning the Secretary of War. I thought that at first, too. I’m wondering now if that is the date it was created. I was wondering the very same thing! It’s got to be the date the scrimshaw was made…. 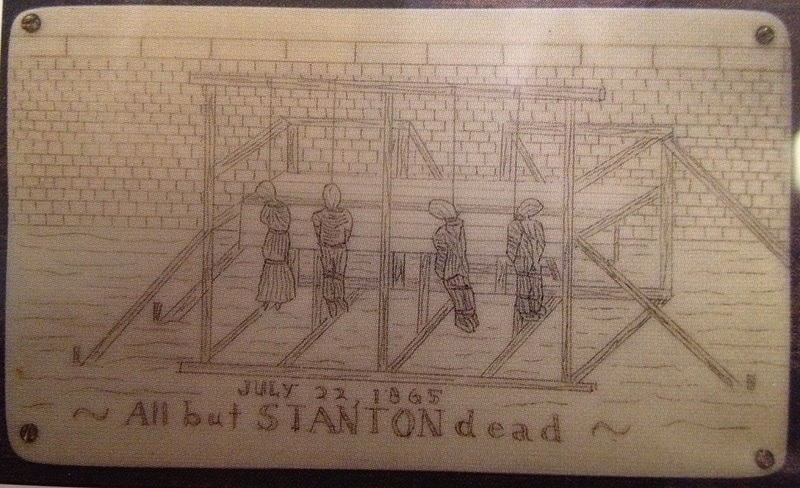 It would appear that they would put the execution date under the remarks about Stanton and the date it was made (usually with the artist’s signature) in the corner…. It IS beautiful, though! Thanks ever so much, Dave! OR, PERH. IT WAS COPIED FROM ONE OF THE WEEKLIES (HARPER’S OR LESLIE’S) , WHICH MAY HAVE BORNE THAT DATE. THEY WERE ALWAYS 2 WEEKS BEHIND THE EVENTS, IN ORDER TO CREATE THEIR WOODCUTS AND PLAN THEIR LAYOUTS. Richard may very well be correct on this one. Also, is this a current catalog? Frankly, if the piece dates to 1865 and is real scrimshaw on ivory, I don’t think a minimum of $300 is that bad. I remember forty years ago drooling over a full tusk of scrimshaw related to the assassination that was being offered at a high-end antique show that our church sponsored for decades. The asking price of that piece was $900. Hi everyone! I think I finally found the place some of my favorite fellow “Boothies” took off to… (this is Jenny if you remember me from elsewhere)! Anyway, in regards to this post, that IS a pretty impressive piece of work despite the morbid subject.. Thanks for the compliment, Jenny. Luckily for us there are many wonderful blogs, discussion forums, and journals out there to further our knowledge of Lincoln’s assassination. The more that exist and provide easy access to information, the better all of us are for it.